Home Lectio Divina Daily Reflections 15 September, 2017: Our Lady of Sorrows – An Irrelevant Misnomer? 15 September, 2017: Our Lady of Sorrows – An Irrelevant Misnomer? Reading 1:1 Tim. 1. 1-2, 12 – 14; Gospel: Jn. 19. 25 – 27. The world looks for happiness and joy today. The basic aim of all human existence is to be happy in life. Various systems of philosophy and theology have come up in history emphasizing the need to be happy life the Carvaka, Epicurian or the Buddhist systems of thought. It cannot be denied that there is a lot of anxiety sadness and misery all around us today. The newspapers are flooded with devastating reports and photos of migrants, outcastes, poor and marginalized who are condemned to a miserable life. Even the rich doesn’t seem to be happy. It was just recently that a young and promising musician jumped from the 12th floor of the building and committed suicide. 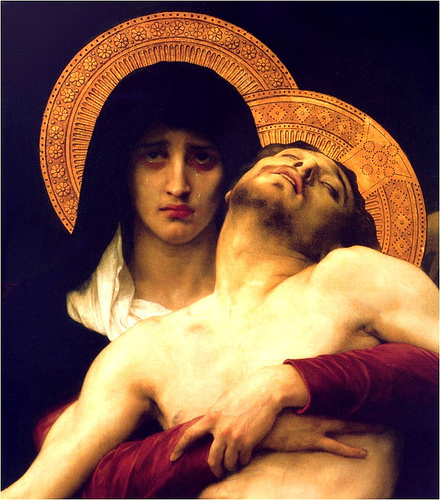 Amidst this gloomy atmosphere, the title and feast of Our Lady of Sorrows may seem to be a misnomer. We can find many our ladies and our gentlemen of sorrows around us. But looking at the life of our Blessed Mother, we understand that the real meaning of this title is not our Lady filled with sorrows, as if showing that human life is bleak and gloomy, but our Lady who knows what it is to be sorrowful. She knows the sorrow of a woman who is suspected by her husband; she knows that sorrow of one who has to run away from home and be a migrant; she knows the sorrow of one living in abject poverty that he/she cannot even meet the basic needs of a new born child; she knows the sorrow of a parent who is alone; she knows the sorrow of parents whose children are condemned by the society as rebels and mad, and she knows the sorrow of a woman who has to look at the death of one’s own child. Precisely because she knows what pain and sorrows mean, she has great relevance to today’s world. Her heart was moved when at Cana the wine ran out because she knew what it means to be in need. When Jesus told ‘this is your mother,’ he was telling ‘here is a mother who can feel with you in your sorrows.’ It is one thing to have a theoretical knowledge about suffering and another thing to have a practical experience of the same. The former would write a treatise on suffering while the latter would run to alleviate pain and suffering. The feast of Our Lady of Sorrows reminds us that we have a mother who can feel with us in our pain because she knows what suffering means. Next article16 September, 2017: Mouth Speaks what the Heart is full of.